I've only recently started playing around with AdSense Players, which combine Google's AdSense program with videos from YouTube, so I've been on the lookout for innovative ways that webmasters have tried to blend them into site content. 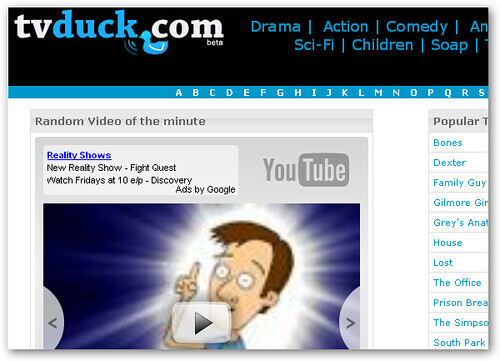 TV Duck definitely makes the list as far as cleverness of implementation is concerned. On a video link site, which hosts links of popular TV shows like "Lost", "Prison Break", and "Heroes", AdSense Players present extremely relevant video content that users are actively looking for. The YouTube player looks like it belongs on the site, and some users might even think they will be watching episodes of copyrighted TV programs by hitting the play button. In addition, the heading "Random Video of the minute" implies that the AdSense Player is just serving additional content for the site and isn't really a vehicle for advertising. You should watch the videos in your video unit only to the extent that you need to monitor the content that is appearing on your site. Similar to publishers who reload their pages in an effort to generate revenue from CPM ads, excessive viewing of an individual video in your video unit would constitute a violation of AdSense policy. This is because new CPM ads may load every time you view a video in your player.